Although most mothers are able to produce enough milk for their babies’ needs you may have concerns about your own supply. Perhaps you and your baby had a difficult start or were not given the support you needed to establish breastfeeding. Or all may have seemed to be going well until your baby’s weight gain pattern faltered. Sometimes well-meaning people sow the seeds of doubt in a mother’s mind. And if your baby is fussy, wants to feed much of the time, seems small, or gains weight slowly, you may be wondering whether you have enough milk. Young babies need to nurse frequently to get enough milk and establish their mothers’ milk. Using feeding schedules, regular supplements, or a dummy can really reduce your milk production. Breastmilk is a drink too and frequent nursing is normal. Adults rarely go longer than a couple of hours without a drink, snack or meal. Your baby’s tummy is tiny and breastmilk is quickly digested so he needs frequent feeds to help him grow. A baby who sleeps a lot rather than waking to feed every 2–3 hours may need to be wakened to nurse, particularly if he has jaundice or isn’t gaining enough weight. If this is difficult or your baby is lethargic, ask your midwife, health visitor or GP to check that all is well. Take action to ensure he gets more milk. Seek help from your GP to rule out an underlying medical reason for your baby not thriving. Talking to an LLL Leader can be reassuring if you are not certain whether your baby’s weight gain is adequate. A good intake from the beginning will see the thick, sticky black meconium poos passed within 3 days of birth, followed by at least 6–8 wet and 3–5 dirty nappies in each 24 hours. Expect yellow, loose, unformed poos at least the size of a 2p coin. From about six weeks, some babies have abundant poos once every few days. This isn’t a problem when a baby has plenty of wet nappies. You may instinctively know how your baby is doing. Does he have good colour? Is he nursing vigorously? Is his skin firm? Does he look healthy and seem active and alert? Is he meeting developmental milestones? Even if your breasts feel empty, there’s always some milk there. Full breasts and engorgement slow milk production and are a sign you may need to nurse more often. Removing even small amounts of milk from soft comfortable breasts increases milk production. Babies nurse for comfort as well as for food. And those little ‘in between’ comfort feeds can really help your milk production. Expect your baby to want to breastfeed very often from time-totime. Your breasts will quickly adjust to making more milk if you follow your baby’s needs. Every baby has his own individual feeding pattern. If your baby is gaining weight at an appropriate rate, following his own feeding pattern is the best way of ensuring you are meeting his needs. It’s rare that a mother is unable to produce enough milk for her baby and there are many steps you can take to ensure that your baby gets as much breastmilk as he needs. Breastfeed as often as possible—at least 10 times in 24 hours. Wake your baby if necessary. Encourage active breastfeeding on the first breast until it feels soft and comfortable. Then offer the second. Use breast compression (see below). Instead of breastfeeding at set intervals, encourage ‘cluster nursing’— breastfeeding very often at times when your baby is willing to. Encourage breastfeeding for comfort as well as food. It can really help your milk production. Stop using any dummy— breastfeed instead. Night feeds really help you make more milk. Cut back a little on solid foods if your milk production is dropping (see section on Other foods). Spending a long time at the breast doesn’t always mean your baby is getting lots of milk. Check your baby is well attached and listen and watch for swallowing—which is frequent at the start of a feed and less often towards the end. It’s important to seek skilled help early on if you are finding breastfeeding difficult, uncomfortable or painful. Do contact an LLL Leader for suggestions. Comfortable breastfeeding for help with positioning and attaching your baby to the breast. Get some help with household jobs, ignore the dust and eat simple, easily prepared meals for a week or two so you can concentrate on breastfeeding your baby. A couple of days’ bed rest together with your baby can really boost your milk production. Or at least take some time each day to rest with him and concentrate on breastfeeding. Many babies instinctively seek the breast and feed frequently if they can snuggle up close to their mother’s chest for periods of time. Try letting your baby lie on your body, skin-to-skin or lightly dressed, as you recline, so both his chest and tummy are against you. This ‘biological nurturing™’ contact gives your baby lots of opportunity to breastfeed, even in a light sleep, and boosts levels of the hormones that increase your milk. 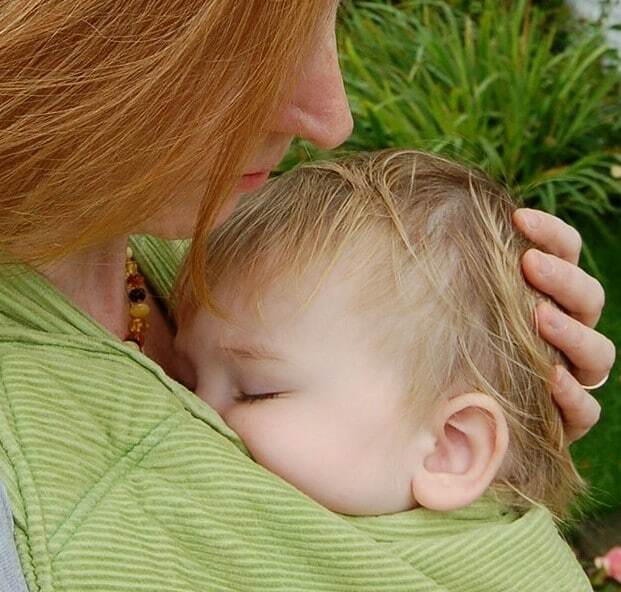 A soft carrier or sling is another good way of keeping your baby close and encouraging breastfeeding. Find out about biological nurturing™. Watch for an increase in your baby’s wet and dirty nappies, and weight gain. Your breasts may feel fuller before feeds and begin to leak. 1. Support your breast with one hand—thumb on one side, fingers on the other. 2. Wait while your baby breastfeeds actively, his jaw moving all the way to his ear. When he stops swallowing, compress your breast firmly to increase milk flow and prompt swallowing. Hold it squeezed while he continues nursing actively then release your hand. 3. Rotate your hand around the breast and repeat step 2 on different areas of the breast. Go gently—this should not hurt. Your baby needs only your milk for the first six months—breastmilk is higher in calories than many weaning foods. 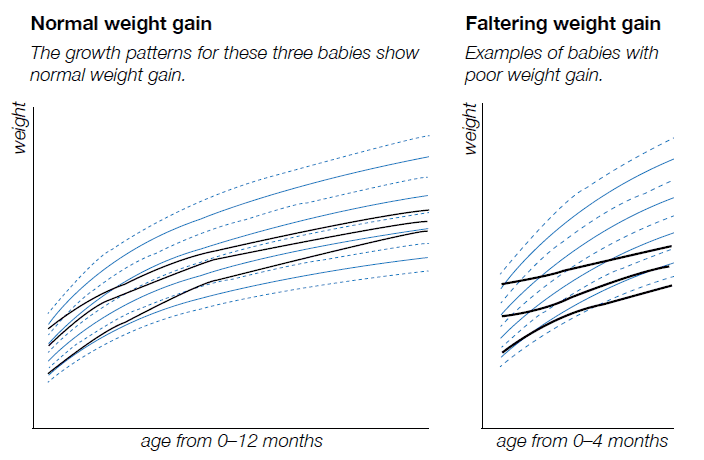 Too much solid food replacing breastmilk can affect weight gain in older babies. Breastfeed before offering solid foods if your baby is 6–12 months old. Even at 12 months, both breastmilk and solid foods are equally important. Breastfeed frequently and, instead of spoon-feeding, let your baby feed himself from a variety of foods to ensure he takes only what he needs. Make changes gradually if he’s already having a lot of solids. If you’ve tried all these suggestions and your milk production is not increasing, there may be a physiological reason. Some medical conditions can lead to low milk production, though appropriate treatment can reduce the impact. These situations are rare but you can discuss possibilities with an LLL Leader. The book The Breastfeeding Mother’s Guide to Making More Milk by Diana West can give you helpful strategies. Don’t forget to be kind to yourself, especially if you’re feeling under pressure. Now is the time to call in favours from friends and relatives so you can concentrate on your baby. If your baby needs more milk talking to your local LLL Leader will help. And at an LLL meeting you can share your concerns with other mothers who will be able to give you encouragement and support. He continues to lose weight. 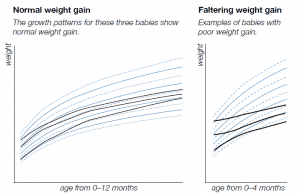 Improving breastfeeding management doesn’t increase his weight gain. Expressed breastmilk is always the best supplement. Expressing can also help increase your milk production. The amount of supplement your baby needs depends on how much milk you are producing and his weight gain. Offer small amounts several times a day so your baby will still breastfeed frequently. 30–90ml at each of several feeds is better than 120–240ml once or twice a day. Avoid bottles if possible. For small amounts of supplement consider cup, spoon or syringe feeding. A home-made or commercially made nursing supplementer is an effective way to offer larger amounts as your baby breastfeeds. (See Nursing Supplementers.) An open cup or a baby beaker with a simple spout (no valves) can be used for a baby from three months. Babies expect fast flowing milk at the start of a feed when they are thirsty. 2. Offer the supplement until your baby is not quite satisfied. 3. Then finish the feed at the breast. This can work well even if you need to give larger amounts of supplement. You can use breast compression while your baby is at the breast. Cup, spoon & syringe feeding Swaddle your baby in a blanket so his hands don’t get in the way and hold him upright in your lap. Half fill a flexible feeding cup or spoon. Rest the cup or spoon gently on his lower lip and tip it so a small amount of milk touches his lips. Leave in position as he swallows, then offer another sip. Take care not to pour milk into his mouth—let your baby set the pace. An oral/medicine syringe can also be used to drip milk slowly into your baby’s mouth so he has a chance to swallow. The following tips can help ensure your baby doesn’t take more supplement than he needs. A smaller teat hole prevents a baby taking milk too quickly. Hold him in an upright position, using your hand to support his neck and head. To encourage your baby to open wide, place the teat across his upper and lower lips with the tip at the ridge between the upper lip and nose. Allow your baby some control. Let him take the bottle teat into his mouth himself. Avoid pushing the teat into his mouth. Tip the bottle just enough to fill the tip of the teat and give a gentle flow so your baby isn’t overwhelmed with milk. As the bottle empties, you’ll need to gradually tip the bottle more and lean your baby back. Encourage frequent pauses to mimic breastfeeding and allow your baby to decide when he has had enough. A baby who is nursing well at the breast is more effective than any pump. But while your baby isn’t breastfeeding well or you’re giving supplements, expressing your milk will stimulate milk production. Give any expressed milk before you give infant formula, so none of your precious breastmilk is wasted. Nurse your baby frequently so he gets the extra milk you make. An increase in the amount you can express is a sign that you can reduce supplements if your baby is nursing well and often. Hospital-grade pumps are most effective for mothers needing to increase their milk—but any pump that works well for you is fine. Hand expression is effective, especially combined with pumping—see Further Reading. Use it to stimulate milk flow before pumping, or after pumping to express the last few drops of milk. Breast compression whilst pumping also helps milk flow. Pumping both breasts at the same time boosts milk-producing hormones. When pumping one breast at a time, switch back and forth several times as milk flow slows. Pump manufacturers generally recommend washing with hot soapy water. If you want to sterilize, once a day is enough if your baby is healthy. Just like your milk, pumping equipment can safely be left at room temperature for short periods and refrigerated in a clean container for longer periods, giving you more time for your baby. See Storing Your Milk for details. After feeds while your baby sleeps—to ‘put in an order’ for more milk later. Milk expressed after a feed may be small in quantity, but high in calories. Infant formula, if given when not absolutely essential to meet a baby’s nutritional needs, can lead to an early end to breastfeeding. It can also put a baby’s health at risk and may have social and financial implications. A decision to stop breastfeeding is not easily reversed. You may need to use infant formula whilst you work to increase your milk production. Powdered infant formula is not a sterile product. To reduce health risks associated with using infant formula, follow carefully the NHS guidelines for preparing it. La Leche League does not recommend the use of home made formula. The free NHS leaflet Guide to bottle feeding is available online here. The Breastfeeding Mothers’ Guide to Making More Milk, West, D. and Marasco, L. McGraw-Hill, 2009.